An asthma attack occurs when the airways of the lung become narrowed causing an obstruction to the flow of air. Symptoms include coughing, wheezing, breathlessness and a tightness in the chest. 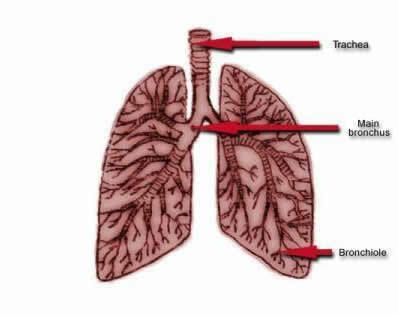 While the larger airways have cartilage in their walls to prevent their collapse, the smaller bronchi and bronchioles do not have this support. 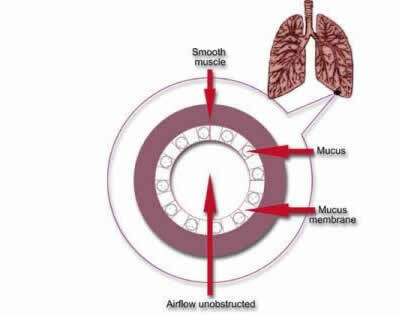 These smaller airways are muscular tubes and their lining contains many mucus secreting cells. 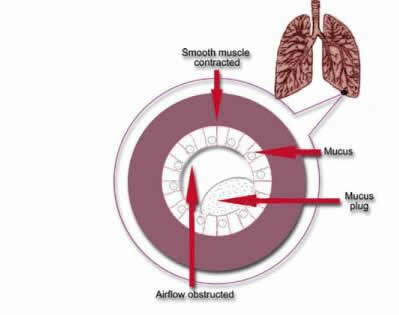 During an asthma attack the muscle wall contracts and the lining of the airways becomes swollen and inflamed. These changes cause a narrowing of the airways which is further aggravated by an increase in secretions from the mucus membrane, which may actually block the smaller airways. All these give rise to an obstruction to airflow. This leads to a significant increase in the effort needed to move air in and out of the lungs, giving rise to wheezing and breathlessness.